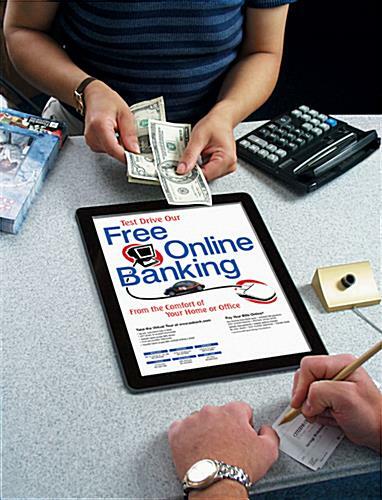 Counter Mat Holds 8.5" x 11"
Turn your countertop into a selling area with a counter mat! 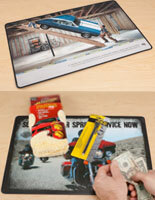 This counter mat, also known as a promotional display, can be used effectively to create brand awareness. 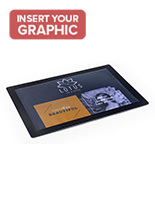 This counter mat has a window for viewing an 8-1/2" x 11" graphic. 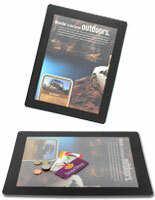 Insert a horizontal or vertical advertisement through a slit on the side and orient the counter mat as needed. 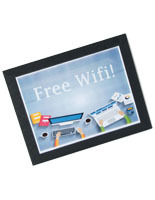 A decorative 1" black border surrounds your graphic. The counter mat is made of rubber and is also waterproof. 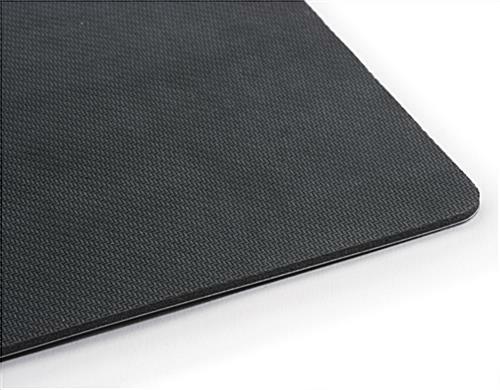 This rubber counter mat has a durable, protective cover that won't produce a glare. It has an 1/8" base that will not skid. 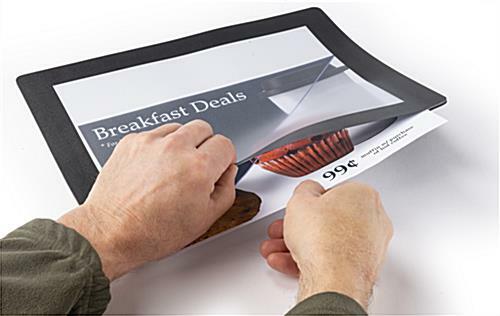 The counter mat will not scratch and functions as a writing surface. Overall dimensions of mat are 10-1/2" x 13-1/8". 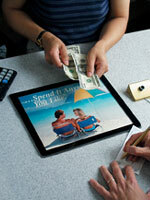 This counter mat, also known as a countertop advertising display, is designed for frequent and heavy use. Please Note: This countertop mat is not intended for use in high volume retail and counter checkout locations where heavy, boxed packaged goods could be routinely dragged across the mat. 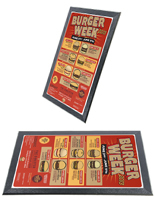 This promotional mat is designed for lighter use environments such as banks, fast food restaurants and convenience stores. For locations with high and heavy box traffic, please consider AFCT8511 . Ordered this item on March 26 and received it the next day! Mats came packaged very well, quality is wonderful and they work perfectly. Thank you for your wonderful review, Daniel! We always take great care when packaging our products, and we're so happy that your mats arrived in excellent condition. We appreciate your positive feedback, and we hope you'll continue to turn to Displays2go for your display needs! Great Counter Mat at good price! I was happy to get exactly what I wanted. They work great to advertise our products and services on our counters where customers come into our 4 locations everyday. The customer have to sign paperwork and they do it on these mats that have our current promos and offers inside them. I shopped around and these prices were good and the shipping was fast. I would buy these again and even consider the 11x17 size next time for more advertising space. I ordered 40 mats and over half came with the corner all bent! We're so sorry that your mats arrived in poor condition. We'll have our customer care team reach out to assist. Thank you for bringing this to our attention. The quality of this product is very good. 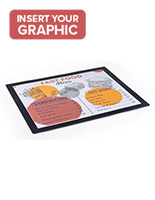 We have been using this mat at our cafe to display menu for costumers. It is just what we have been looking for and we are using only this mat since we open our cafe! These last for many years and are of very good quality. We ordered a whole new set for all of our stores. Thanks for the great review, Paul! We're glad that these counter mats have lasted so long. 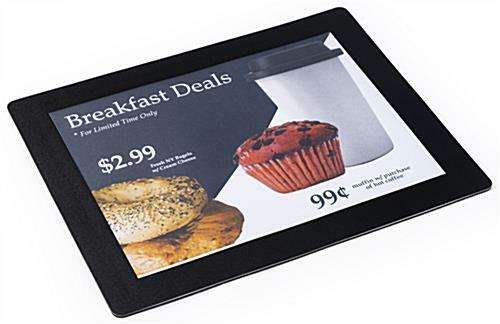 We hope you continue to use Displays2go for your store's needs!